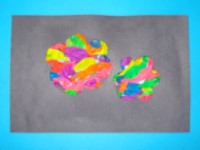 Recycle popped water balloons with this simple craft. 1. Gather your material. 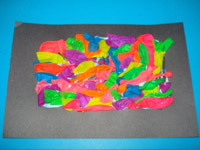 You will need several popped water balloons (variety of colors), two sheets of black construction paper, white glue, and scissors. 2. 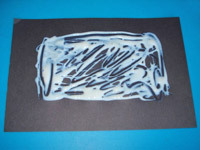 Liberally apply white glue on one sheet of construction paper, leaving a border around the glue-filled rectangle you will create as shown in the picture. 3. 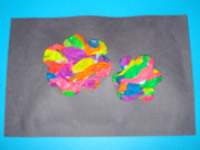 Press tiny pieces of popped water balloons all over the glue to represent mosaic pieces. 4. 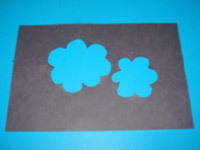 Cut two shapes out of the centre of the second piece of construction paper. Avoid cutting into the border. 5. 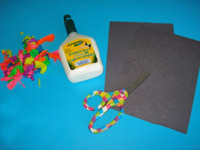 Glue the second sheet of construction paper (with cut-outs) over the first one to complete your mosaic.